Rapid Roof III, Superior Roof Protection from our partners at Conklin, provides protection against the Oklahoma elements, remains flexible to withstand building movement from foundation shifts and Oklahoma earthquakes, and reduces cooling costs for high energy savings. This ENERGY STAR-rated roof coating from Commercial Roofing of Tulsa, OK delivers such substantial savings on heating and cooling bills that many building owners we have worked with see a complete return on investment within the warranty period. an 85% reflectivity rate. This is accomplished with its cool, white surface. The membrane is completely seamless which is perfect for waterproofing. It is simple and easy to clean due to its water-based formula. Along with being dirt resistant, this coating is proven to be durable and provides long term performance. Rapid Roof III can be easily applied over any new or retrofit roof deck including metal, spray polyurethane foam, plywood, approved isocyanurate board (ISO), approved oriented strand board (OSB), asphalt built-up roofing, and approved single-ply membranes. 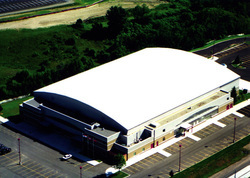 Commercial Roofing of Tulsa, OK offers a choice of colors that are all energy efficient. Available in standard white, light tan, and light gray. We utilize "cool pigment" technology so that they meet ENERGY STAR guidelines for energy efficiency. For inquiries regarding Conklin's Rapid Roof III coating system, contact Commercial Roofing of Tulsa, OK at (918) 992-2020 during regular business hours. You can also reach us 24/7 online by emailing our dedicated team using the form provided on this page.